While at the United Nations Secretariat two-and-a-half decades ago, my work station was the press officer’s desk some steps down to the left from the main podium from where the world leaders speak. If I were there this week when the American president came to address the General Assembly, I would have fallen off my chair. Donald Trump, reading from script rather than adlibbing, which made his message all the more ominous, threatened to blow North Korea off the map. For a country that dropped bombs on Hiroshima and Nagasaki, even the willingness to talk of a strike that would kill millions was shocking. The United States is saddled with a president who is a drag on a country that has defined global relations since the beginning of the 20th century. Under Trump, the United States is in rapid deceleration, unable to address critical issues confronting the planet: climate change, denuclearisation, ending hunger, preventing wars and fighting intolerance. The loss of America’s credibility must hit all its embassies around the world. On Wednesday, Ambassador to Nepal Alaina B Teplitz wrote an op-ed in Republica titled ‘Cleaning Up Government’, flagging the corruption that is rapidly devastating the polity. The Ambassador could have gone deeper than the call to arms against corruption, but Trump’s shadow loomed over the commentary, as it looms over pretty much everything America does these days. 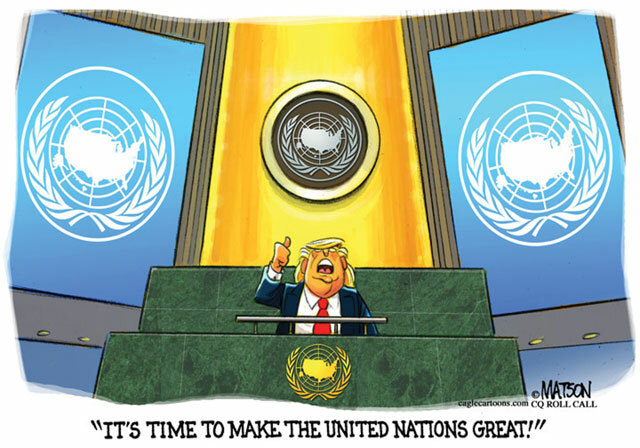 Donald Trump is vain, petulant and reckless, and his speech from the UN rostrum brought out the worst in him. His isolationist diatribe calling for unrestrained sovereignty was not even logical, as it would allow despots of powerful countries to use the same argument. Trump is a businessman who worked the weaknesses of the US regulatory regime rather than display entrepreneurial genius – hardly the kind of person on whose behalf an ambassador would be making the call to end corruption in Nepal. We should certainly heed Ambassador Teplitz’s note of caution at a time when corruption has become endemic. But who will say that Nepalis are unaware of the problem, as exemplified in the successful fight against the agenda of Lokman Singh Karki, Dr Govinda KC’s crusade, the writings of journalist Hari Bahadur Thapa (including his just-released book on corruption in Nepal Rajgaj), and the slew of recent investigative reports in the media? Rather than make a generic call against corruption, the question to ask is: what is it that ails the polity so that these media exposes only seem to further embolden the politico-bureaucratic-mafiosi nexus? We have to be corruption free not because anyone else tells us that it is important. We have to be a corruption-less society because it is important for growth, equity and social justice. Likewise, we need democracy not because other democracies tell us to, but because Nepalis know it is good out of our own understanding and lived experience: the people’s steadfastness in overcoming the Great Earthquake, the Great Blocakade, the shackles in implementation of the new Constitution, and the attempted sabotage of the local elections by pushing them into three phases. Finally, the people of Province 2 made it to elections with 77% turnout, took matters into their own hands, and put their stamp of approval on local government as proposed by the Constitution. No one should think she/he needs to show Nepal the way, though the occasional reminder of higher philosophical principle and rationale is not a bad idea as long as it is made with humility, without trans-global superiority. In this post-development world there will be fewer ‘diplo-donors’ to constantly provide formats and projects, and report us to the world. It is time for local values to define Nepal’s international projection. The world is the poorer for not knowing the socio-political churning this society is undergoing, nor what can be learned from Nepal. Nepal’s diplomatic posture of these past two decades has been to stand still as if no one will notice we are there, and successive foreign ministers have been bound by obeisance to the Cult of Obfuscation and Hand-wringing. In future, Nepal should not have to meekly take the advice of plenipotentiaries about the delights of democracy. With the Constitution in the bag and various elections conducted, the next big fight is to prepare for corruption-free governance. And when push comes to shove, and as the needs of geopolitics trump the values of good governance, you can be sure there will be no ambassador standing by the side as we confront the carpetbaggers and power brokers. For now, I only wish that Nepali diplomacy had the gumption to support Qatar as it resists the Saudi-led blockade, and to critique Aung San Suu Kyi while vocally supporting Bangladesh as the country having to host the outflow of Rohingya people.